There are many platformers that utilize the same gameplay structure. You start off in “World 1 Stage 1” and progress through different stages before reaching a boss battle. Rinse and repeat. 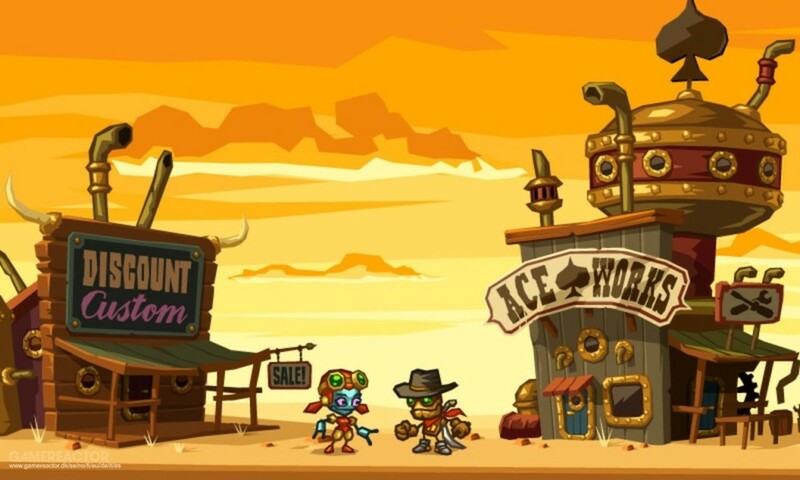 Steamworld Dig is a game that does things a little bit differently, and it works brilliantly. Rather than be stuck in an extremely linear process of progression, Steamworld Dig gives the player a bit more freedom. There are “worlds” but you are free to progress through them at your own pace. That stereotypical structure exists; but, it is masked by a layer of exploration. You are placed in the shoes of a robot named Rusty, and are given the rights to your Uncle Joe’s mine in the town of Tumbleton. When you arrive to the mine you find his dead body. The rest of the game is your journey through the mine trying to find out what happened. The story wasn’t particularly engaging and I found it to be a bit of an afterthought. The bulk of your time will be spent gathering minerals and selling them back in Tumbleton. The money you make is extremely important. It allows you to upgrade your health, pickaxe, and lantern capacity, amongst other things. The farther down you go into the mine the more important these upgrades become. Near the surface the rocks are easy to break with a standard pickaxe but the farther down you go the longer it takes. The upgrade system was one of my favorite parts of the game. It gave meaning to my mindless mining and constant traveling between the mines and the surface. It becomes cumbersome at times to have to keep backtracking but the upgrades make it feel worth it. Another reason the upgrades are so important is because of the threats you encounter. It is because of this that there are inherent risks when you going deeper into the mines. It isn’t until you realize you’re almost out of health, your lantern is about to burn out and you’re not close to the surface that the difficulty of this game comes into light. In my play through I died 74 times; it probably should have been more. The difficulty was almost a downfall for me. I enjoyed that I wasn’t able to just waltz through the game with my eyes closed but there were instances where I thought the game was unfair. You can carve a path through a tunnel only to realize that it’s near impossible to get back up. The ladders didn’t work well for me and it is easy to get stuck. It is a part of the learning curve and eventually you get enough upgrades that you can get out of nearly any pickle you dig yourself into. But, it can still be frustrating. Having said that, the checkpoint system is broken, and I’m speaking specifically about the final boss fight. It is incredibly difficult compared to the rest of the game. There are three separate parts to the fight and if you die at any point you must start from the beginning. For a game that was so generous with checkpoints I found it distasteful to suddenly make the game so unforgiving. That is, however, my only complaint. This game was right up my alley and I thought it was fantastic; the art style, the controls, the concept, all of it. Great. It forces you to pay attention to what you’re doing. It is just hard enough to keep you engaged. The exploration is awesome. The upgrade system is awesome. The game was just awesome. Its available on damn-near every platform and if you haven’t played it yet you definitely should. SteamWorld Dig 2 is a sequel that does more than simply update the original. It creates a larger world structured like a Metroidvania by adding more mazelike corridors and open rooms. On the flip side, the digging segments feel more tedious this time around, especially when compared to the excellently designed challenge caverns and environmental puzzles. Forza Horizon 2 Presents Fast and Furious is a fun take on simulation driving. It features all of the tuning possibilities of a racing sim but the physics and controls are more of a sandbox arcade racer style. It's a match made in heaven. Although this expansion is short and skimpy on features, it's still fun and I had a great time to playing through it. If you already own it, I wouldn't recommend picking this up even if you are fancying a second playthrough and own it elsewhere (why waste the money on a game you already have?) but for first timers, go for it. It's fun, well made, and hopefully if it does well, we'll see some sequels set in their weird post-human no-electricity world. A dash of Terraria mixed with a pinch of Dig Dug, SteamWorld Dig is a colourful delight that is equal parts wit and charm. Despite not really achieving anything with its barely-there story, SteamWorld Dig is an excellent surprise from an independent studio putting out a game that is more than the sum of its parts. Maybe in the future developers Image and Form might delve more into the story that makes this robot-western world tick, but for now, I'll accept the excellent gameplay and a superbly-paced upgrade tree instead.